In fifth grade students come with lots of background knowledege on American Indians from previous years. 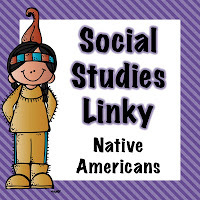 They have a huge unit in second grade in which they look at different cultures and they also have a big unit in fourth grade that studies the native people of Ohio. So, we take this a step further in fifth grade and look at the cultural groups of the North America. The essential question is: How does geography influence American Indians' daily lives? Introduction Activity: The first thing I do (on the first day of the unit) is have students perform a simulation in which they have to "settle" around my room. They have to choose their own spot for learning and they can decide to learn and live anywhere in my room. Then I project these questions on the SMARTboard for the students to answer while in their "spot." These questions start to target the concepts in our unit. Our focus is on the the regions that American Indians settled and how they impact each group's lives. Therefore, we start mapping out regions of my classroom in which students settle. There are areas that are more populated and areas less desirable... but each have their own advantages and disadvantages. This leads into our discussion that American Indian tribes were spread out the same way across North America. They all lived in many different places and have many different resources available and they used those resources to make their lives as comfortable as possible. I feel like this simple lesson hits home to big idea right away - where you live has an impact on your life. I bring this simulation back up as we study each region when I feel like the students need a concrete example... I might say something like: Those of you that chose to live by my sink... remember, you had all the water you wanted just like the forest tribes. However, those of you living under my pencil sharpener, you were trying to figure out how to save up your resources just like the Hopi in the desert. The activity takes about 20 - 30 minutes depending on how long you want to stretch it out and it's a great introduction into cultural regions. Review/Cross-Curricular Activity: I love trying to bring Language Arts into Social Studies as much as possible. I got this idea from a colleague who is now retired! Shout out to Patsy! I made it my own but essentially, kids get assigned or choose a group we studied and they write a short poem about what we've learned. I usually model it first with a group like the Arctic or Subarctic - I show how easy it is with the class version on the SMARTboard. Then I assign groups and turn the students loose. This is a great review activity and it's a lot better than memorizing a study guide. Last year, I did a jigsaw so each table group had a cultural region and then one person had to share out so that all groups were represented. If you want a copy of the handout you can click here or on the graphic. There are three prompts to a sheet ready for copying and pasting into notebooks! I used this activity as a quick write for Social Studies and only gave the students about 15 minutes to complete their entry. My example took about 5 minutes on the SMARTboard... I move through it pretty quickly taking audience suggestions. OH, am I so happy I checked Bloglovin' today! This is the perfect lesson at the exact perfect time. Thank you!! I think that I just found my intro activity for Thursday! Thanks for linking up! It was my pleasure :) Hope it works out for you! Let me know how it goes for you! I love this activity. I'm adding it to my Native American unit for my 4th graders. Thanks so much for sharing! Adding this to my plans! Thanks! In many countries governments have become increasingly unwilling or unable to Continue to raise the share of public expenditure spent on assignment help for free education. The prime focus has switched accordingly to attempts to obtain higher output from given expenditure level. The most important part of effective ICO is the good white paper writing, this is the first thing which each and every potential investor will discover.